Given my fondness for Japan Food Town (JFT), which houses 14 different Japanese concepts, going to Yomoda Soba is an easy choice. This is the 5th restaurant I’ve eaten at JFT. “Yomoda” comes from a Matsuyama dialect from Ehime Prefecture. It means “carefree” or “easy-going,” used on people who are optimistic and have a sense of humor. Here, the word means the camaraderie of warmth and joy. All ingredients are imported from Japan. Using only the center of buckwheat, the Sarashina soba, characterized by its white color, are made freshly in the store, using purified water. They don’t use MSG. 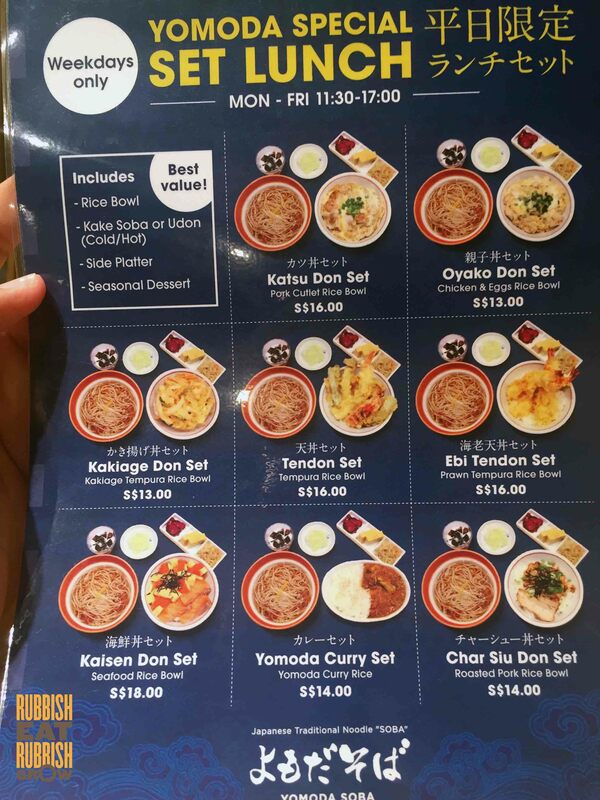 Their set menu for lunch starts at $13+ and dinner at $16+. They have traditional soba and innovative ones. 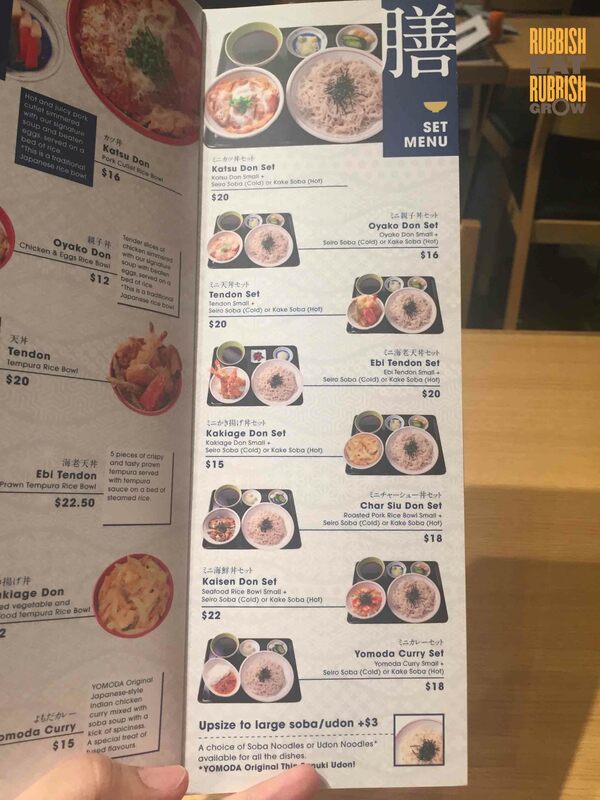 The menu has a dazzling array of soba, which may be confusing; some soba are served in the broth while some are dipping soba. 1. Dipping cold soba with hot broth, which is called tsuke soba: they have different flavors such as curry chicken nanban tsuke soba ($20). 2. Dipping cold soba with cold broth, known as serio soba: includes seiro soba ($8.80) and goma soba (sesame sauce, $12). The Seiro soba is Kanto-styled, using soy sauce mixed with dashi stock from bonito and kelp. 1. 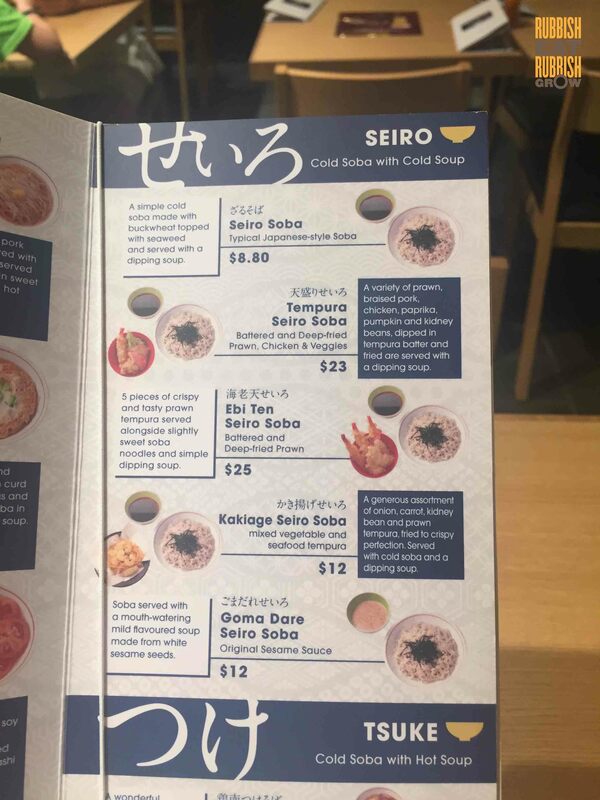 The hiyakake soba (cold soba submerged in cold broth) has choices like the traditional kitsune soba (bean curd skin on soba, $16), cold katsu soba (pork cutlet on soba, $18.50), cold tomato soba ($15). 2. Kake soba (hot soba in hot broth): flavors include hot spicy soy milk soba ($22). I ordered the set lunch, which includes a kake soba and tendon ($16): very good value! The broth for kake soba is Kansai-styled, using light soy sauce and dashi sauce which is boiled from mackerel, sardines, bonito, kelp, and shiitake mushroom. Both the tendon and the soba are alright. 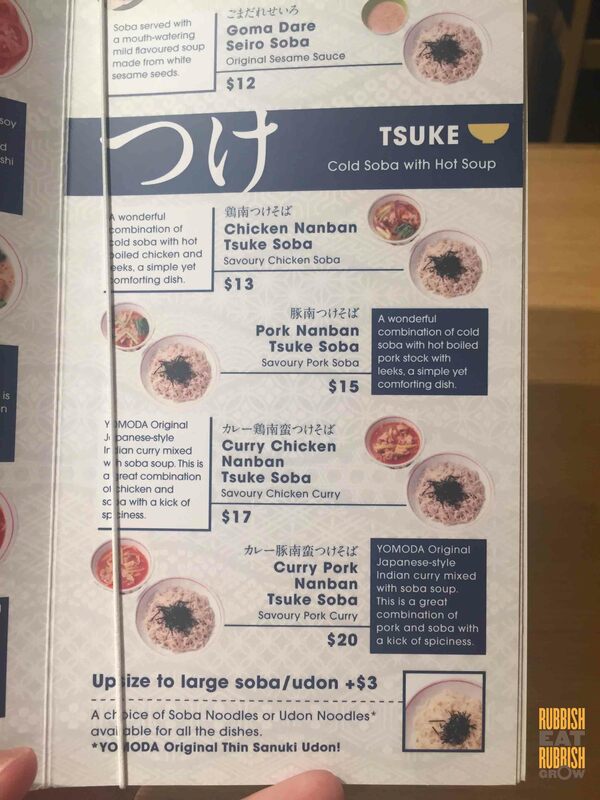 The soba has a musky smell that I don’t quite like, but at this price, it’s a-okay. 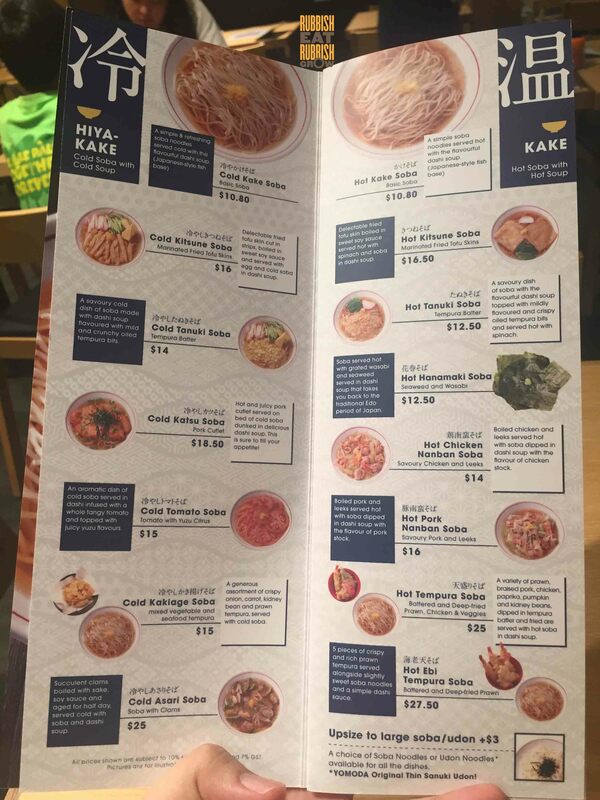 I’m interested in the tomato broth soba and the spicy soy milk soba. Don’t mind returning to try them. With taxes, I paid about $20.